The history of Naxos is enviable, with several major archaeological sites and ancient hillside villages. Cycladic culture was once centred on Naxos, while the mythological Greek god Zeus remains interweaved within the island's heritage. Over the centuries, many powers had a hand in the island's growth. Today, the island is also a big draw for discerning tourists, due to its noticeable lack of overly developed resorts and hedonistic travellers. Greek mythology dictates that the king of gods, Zeus, is said to have been raised on Naxos, after being born on Crete, with his named being immortalised here by the island's towering peak, Mount Zeus. Historically, the island was the hub of civilization in the Cyclades group of islands between the years of 4000 BC and 1000 BC. The ancient Thracians were the first here, after which the Careans took control of the island, drawing its name from their leader Naxos. The island was at its wealthiest during the 7th and 8th centuries BC, and the 'unfinished' Kouros statue in easterly Apollonas is testament to the early rulers' power and know-how. This enormous statue rests on the ground, within the quarry from where it was hewn. The remnants of the huge marble Apollo Temple (Portara) atop a hill near Naxos harbour is a reminder of this prosperous period. Only the gate remains, however, but the climb, views and sunsets are fantastic. Also from the 6th century BC, and somewhat more impressive, are the ruins of the Temple of Demeter to the south of Sangri. It, too, has a hilltop setting, while the 17th-century Bazeos Castle is another prominent sight based in Sangri. The father of Greek history, Herodotus once said that Naxos was the country's most prosperous island. Such was the island's meteoric rise that it tried to leave the Delian League association of Greek city-states, although Athens put sway to this. The island continued to churn out impressive structures, including that of the recently restored 4th-century BC Cheimarros Tower. From this point in history, beginning in 41 BC, Naxos, as with other Aegean islands, was ruled by successive powers. These included both Macedonia and Ptolemy, as well as the Roman and Byzantine Empires. Following Byzantium in the Middle Ages and the decline of the Fourth Crusade (1202 to 1204) came the Dukes of Naxos under the Venetians, who took the Cyclades chain. They ruled the region into the 16th century, along with other parts of the Aegean. 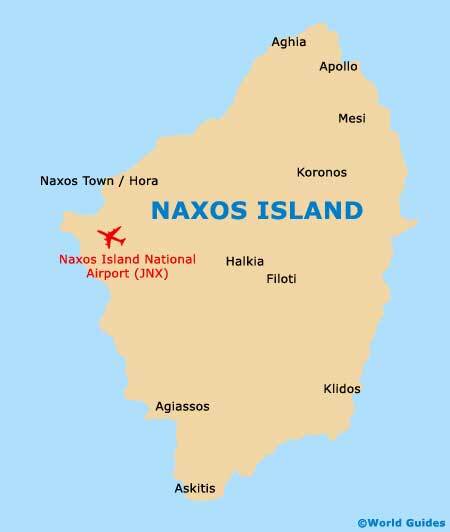 Of note, Naxos was known as Nasso at this time. The Venetians built a castle in Hora (Naxos Town) in the 13th century, and within the walls remains a lovely medieval town and ancient Catholic cathedral. Although the Ottoman Turks were running roughshod over the region, the island was mostly left to the Venetians in return for taxes. Their influence was thus minimal, although they were on the scene until the 1820s, when the Cyclades revolted. The island then wound up in the hands of the Greeks. Naxos history remains one of the most impressive of the Cyclades islands, and its lands are certainly the most fertile of the chain. Tourism is second to agriculture, although the island does receive many visitors and has developed popular beach areas and facilities around Naxos Town in particular. The archaeological sites are easily accessible and there are a number of hillside villages, including those of Filoti and Apiranthos. The Cave of Zeus at the bottom of Mount Zeus is another draw to the interior.